WARNING: This booklet contains images of Aboriginal and non-Aboriginal people who are now deceased. This is a celebration of a special event and is provided as a record of the history of a prominent place in Aboriginal contemporary history. Acknowledgements Rev. John Brown Gribble – responsible for establishing the former Warangesda Aboriginal Mission in 1880. The Aboriginal people who helped establish, moved on, were born on, were raised on, died on and were forcibly removed from the former Warangesda Aboriginal Mission. Jeff and Rohan King and families – who own and have maintained a strong family connection to the property since 1926, and who continue to allow access to the former Aboriginal mission site particularly for descendants of Warangesda. Dr Peter Kabaila – preparation of content for the exhibition and historical storyboards. The Articulate Pear – exhibition and historical storyboard design, booklet design, and production assistance. Graham Inglis, Precision Signs in Wagga Wagga – exhibition and historical storyboard print production. Brett Naseby, Photographer – photography of exhibited artwork and launch event. Cover and Inside Front Cover: Detail of corrugated iron from the Warangesda Girls Dormitory. Photo by Brett Naseby. © Warangesda Project Working Group, 2018. All rights reserved. Except as permitted under the Australian Copyright Act 1968 (for example, a fair dealing for the purposes of study, research, criticism or review), no part of this book may be reproduced, stored in a retrieval system, communicated or transmitted in any form or by any means without prior written permission. 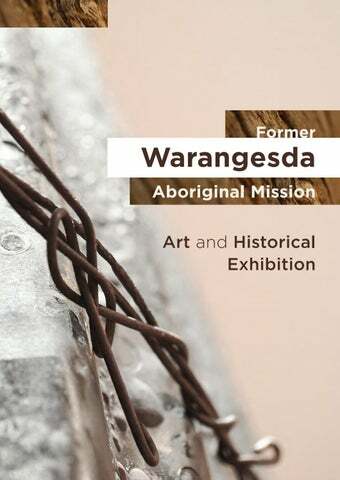 Background to the Project Warangesda has always held strong significance to many Aboriginal people throughout New South Wales, Australia and in fact across the world. This project started through a conversation with Aunty Heather Edwards of Darlington Point in 2016. Aunty Heatherâ&#x20AC;&#x2122;s mother, Isabel Edwards, was born and raised on the former Warangesda Aboriginal Mission at Darlington Point, and Aunty Heather has strong connections to Warangesda. That conversation came up with an idea of doing an exhibition that showcased the history and heritage of the old Aboriginal Mission. The project idea was presented to Raina Savage and Raymond Wholohan at the Griffith Regional Art Gallery who expressed dedicated support and interest in assisting with the project. A working group was then formed to guide the development of the project. The project expanded to include an Aboriginal art component with support from the Western Riverina Arts. Dr. Peter Kabaila, archaeologist, architect, historian and heritage advisor, was engaged to prepare the historical and informative story boards. Itâ&#x20AC;&#x2122;s such an important site for local Aboriginal people and beyond. Iâ&#x20AC;&#x2122;m very glad there has been a recent interest in Warangesda Mission and its legacy. 10. Treahna Hamm Journey to Warangesda (2017) Linocut 06. 64. Bill Wallace and Faye Clayton Moseley Memories of the Past Acrylic on canvas 64. 04. Warangesda Bible – (a) & (b) Collection of St Paul’s Church, Darlington Point 05. Diorama of Warangesda Mission Collection the Edwards Family 06. 10. Objects from Warangesda site inspection by Peter Kabaila in 1993 Collection of Pioneer Park Museum 11. Pictured: Aerial view of the former Warangesda Aboriginal Mission site in 1993. Photo by Peter Kabaila. WADDI HOUSING and Advancement Corporation Ltd.